Exclusive Raw Data Digital acquisition and storage. Weighs 10-pounds, including 4-hour battery. Color Doppler, Spectral Doppler, B, M, Triplex, 3- D.
On-board patient, image and reporting archive. CD-ROM disk burner included, plus PCMCIA and USB. Anatomic M-mode creation and adjustment. Gain, magnification, and colorization control. 3-D Digital processing and manipulation. Clip and still measure-annotate-enhance-store new. 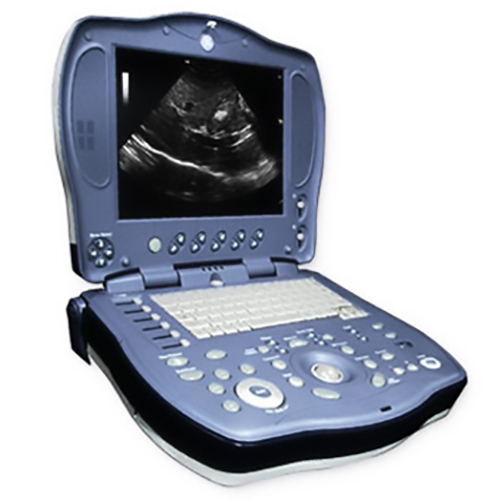 DICOM 3.0 capable, plus VetPACS all Digital interfacing. 4.2 kg (9.2 lb) (without battery). Height: 78 mm (3.07 in) console only 99.5 mm (3.92 in) with handle. Width: 350 mm (13.73 in). Depth: 280 mm (11 in) console only 320 mm (12.6 in) with handle. Width: Minimum 305 mm and Maximum 336 mm. Height: Minimum 245 mm and Maximum 271 mm. Ergonomic, intuitive key layout. ‘Soft click’ hard keys with mechanical and acoustic feedback. Special function keys with additional perceptible marks. Two programmable ‘User Define’ keys. High-performance TFT LCD. 10.4″ display. Standby function with a pre-selectable timer for protection. Automatic Optimization (Auto Tissue Optimization, Auto Spectrum Optimization and Auto Color Optimization). Built-in patient archive with images, patient information. Rejection function, adjustable from 2 to 20 in 6-digit steps. D-Mode. (Gain; Dynamic Range; Transmission Frequency; Velocity Scale/PRF; Wall Filter. Image Rotation: 4 steps, Rotation: 0°, 90°, 180°, 270°. 256 Shades of Grey Zoom. It’s possible to export to other formats into CINE Memory/Image Memory. CINE Gauge and CINE Image number display. Measurements/Calculations & Annotations on CINE Playback Images. Auto Doppler Trace function with automatic calculations. Time-Averaged Max. / Mean Velocity.